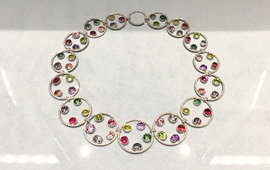 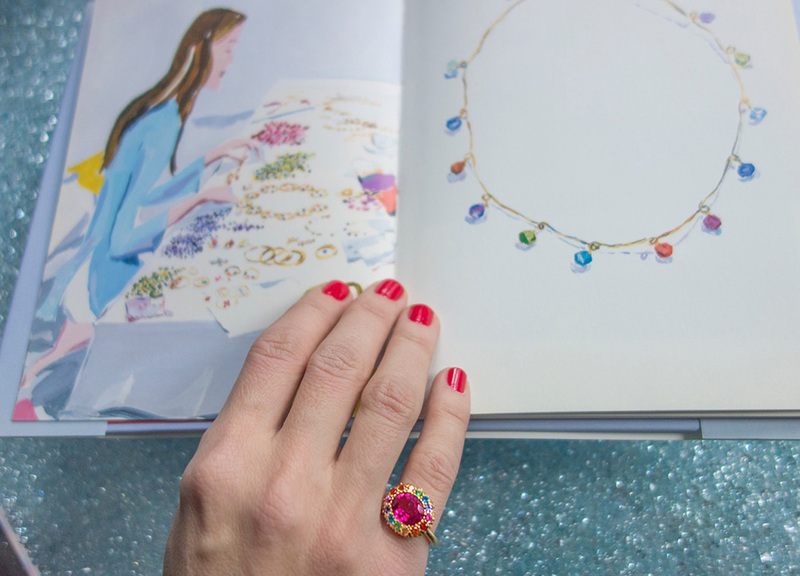 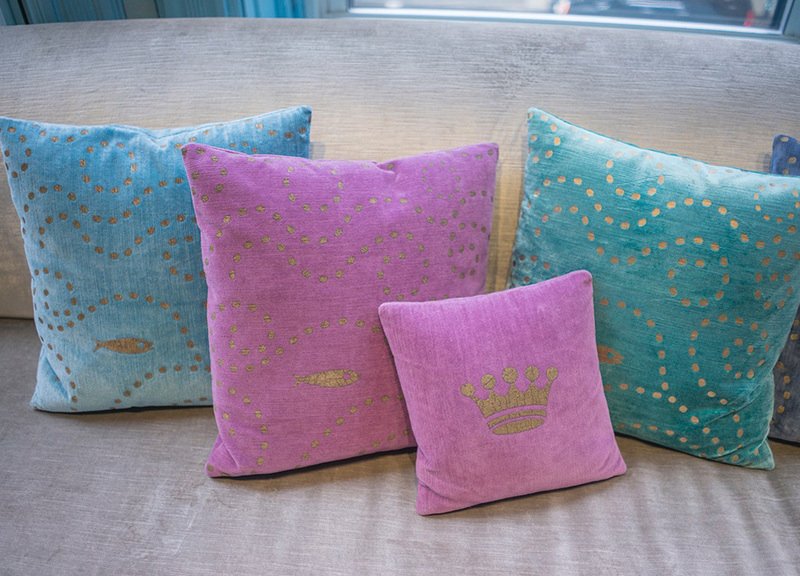 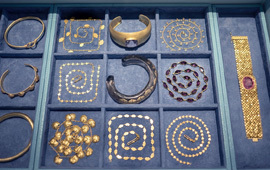 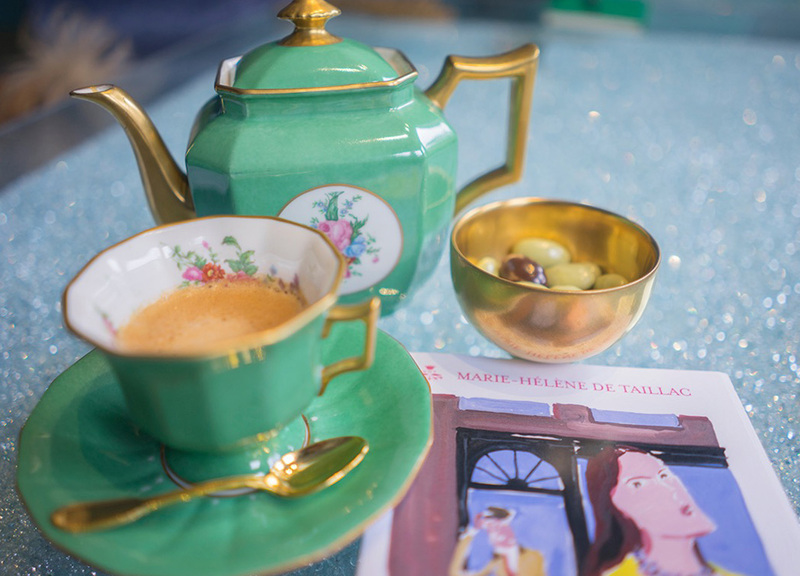 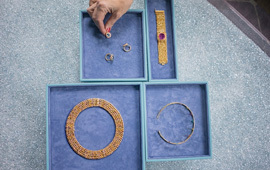 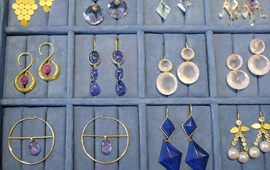 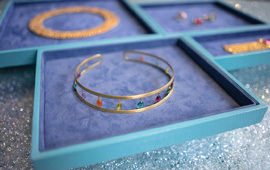 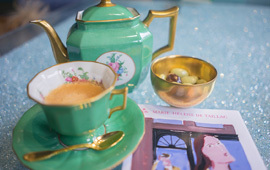 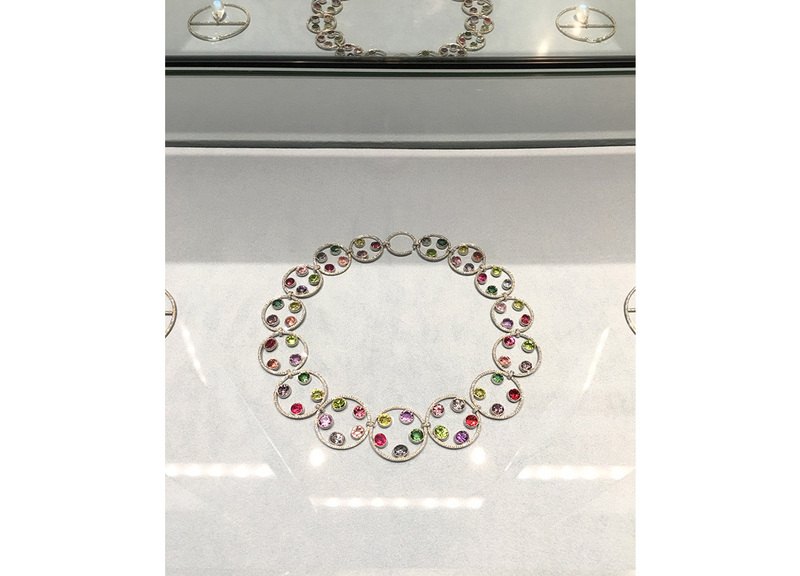 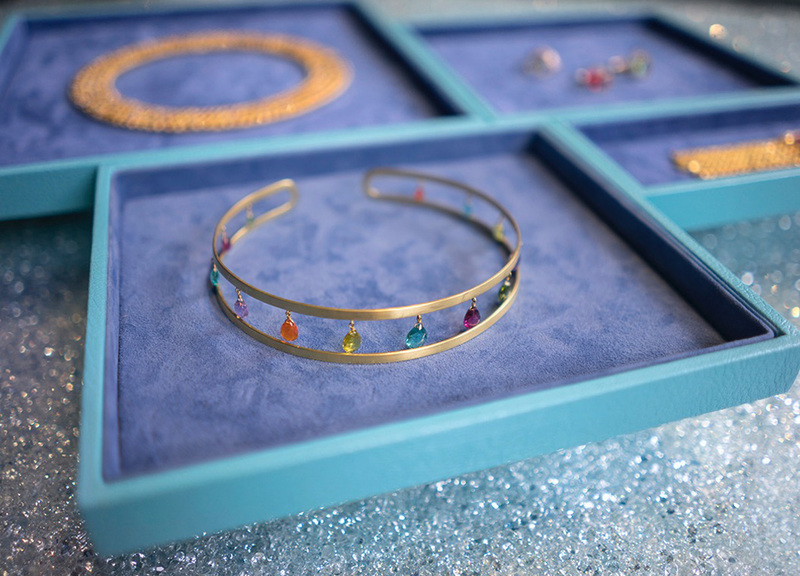 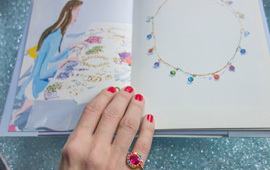 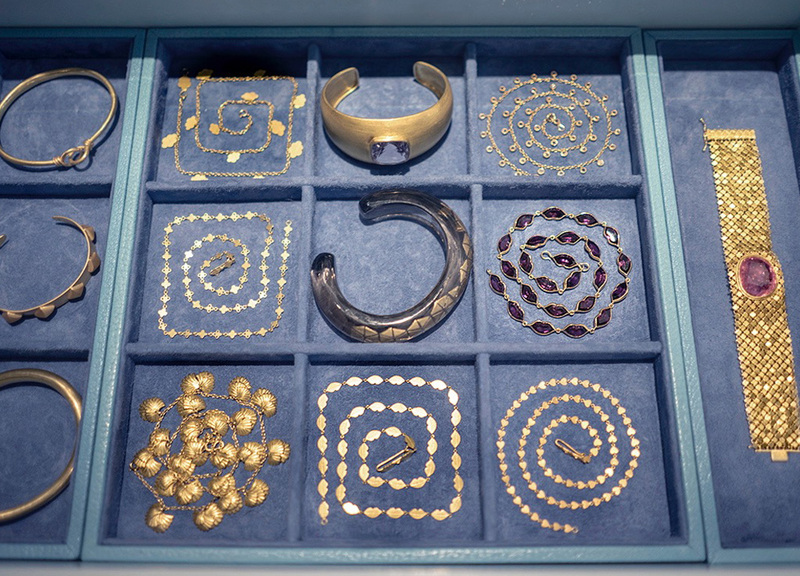 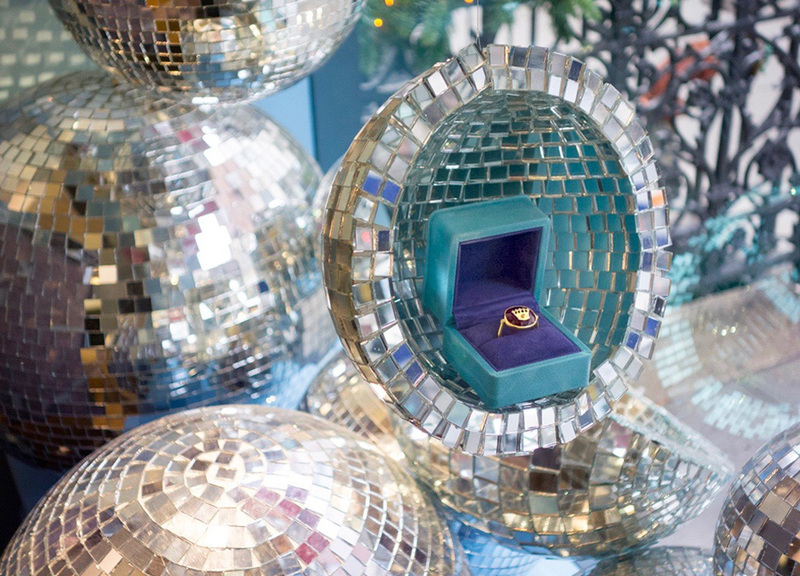 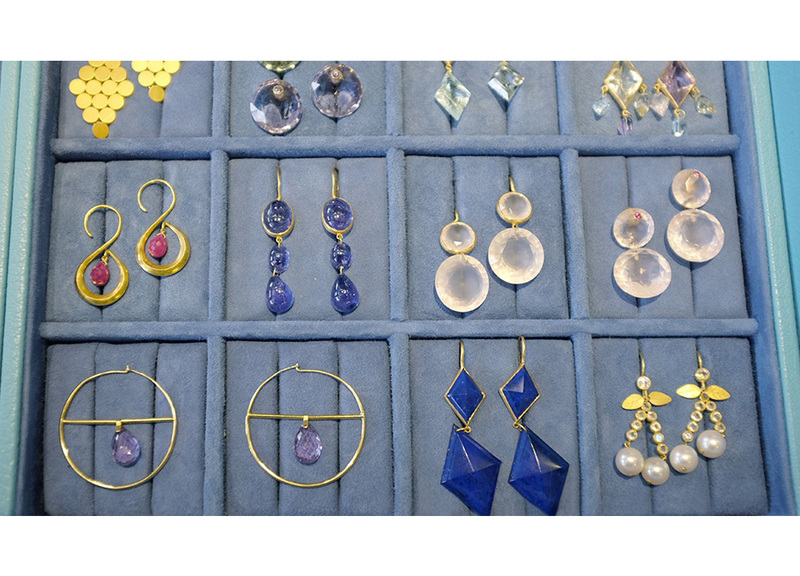 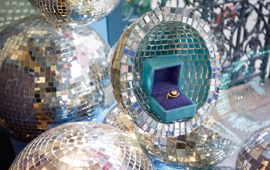 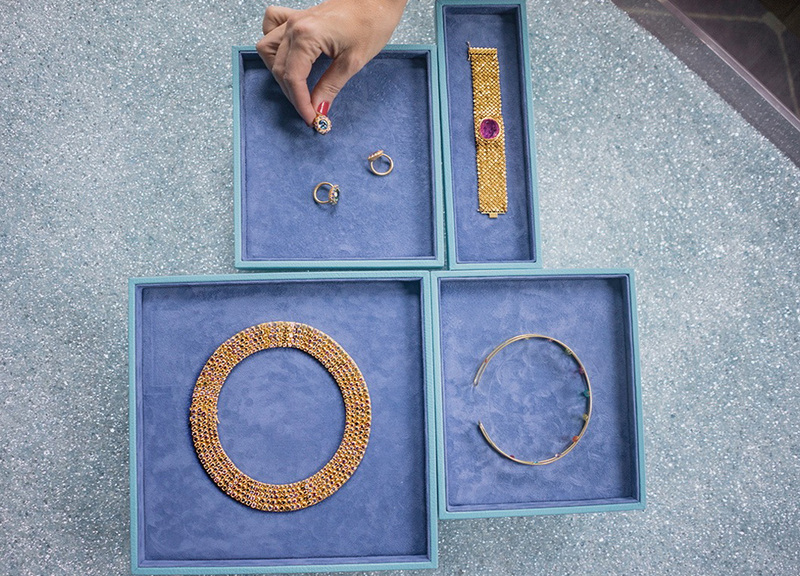 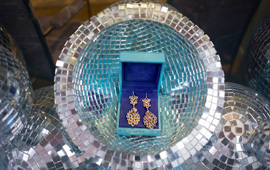 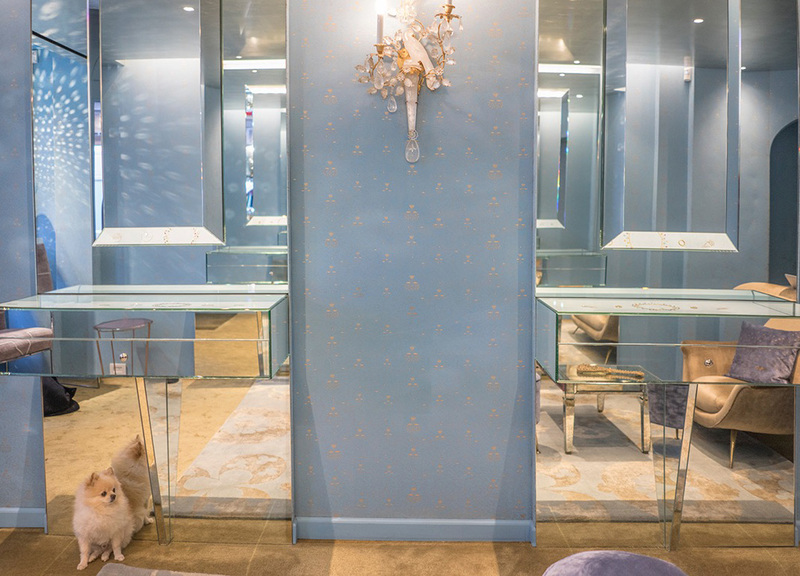 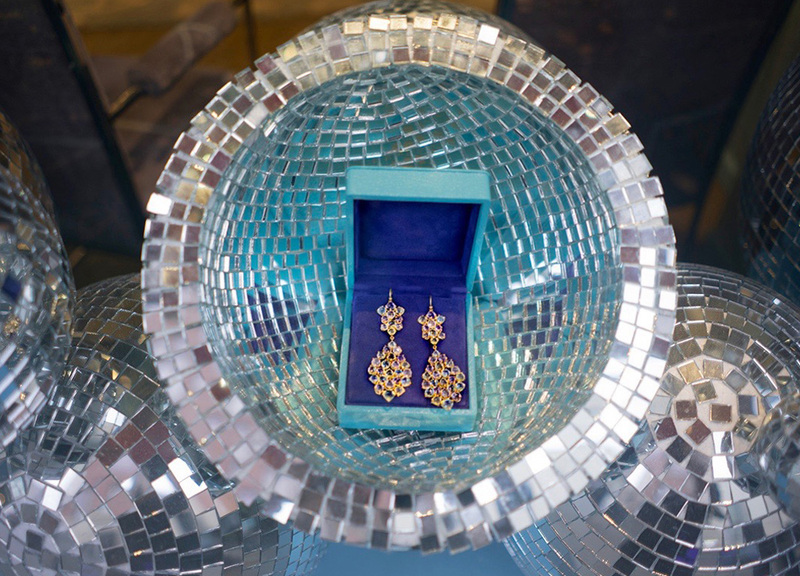 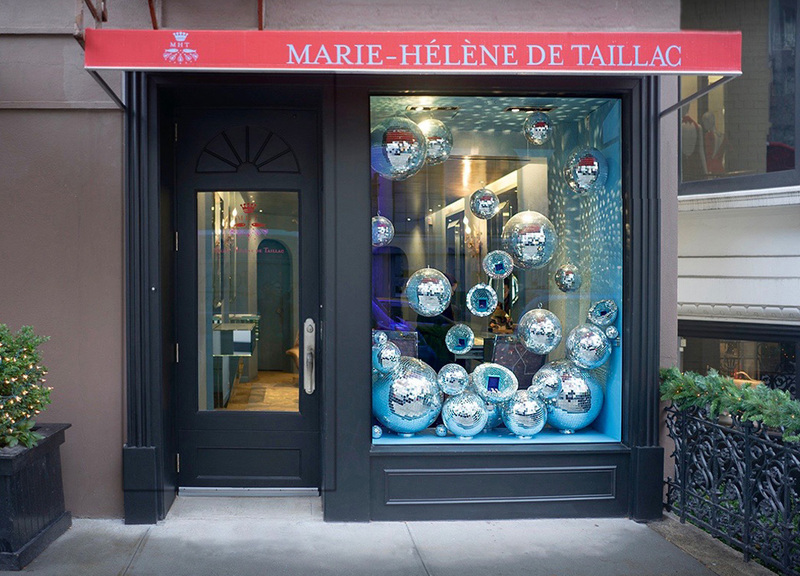 Marie-Hélène de Taillac brought French savoir faire to the Upper East Side of Manhattan when she opened her gem of a jewelry boutique in 2013. 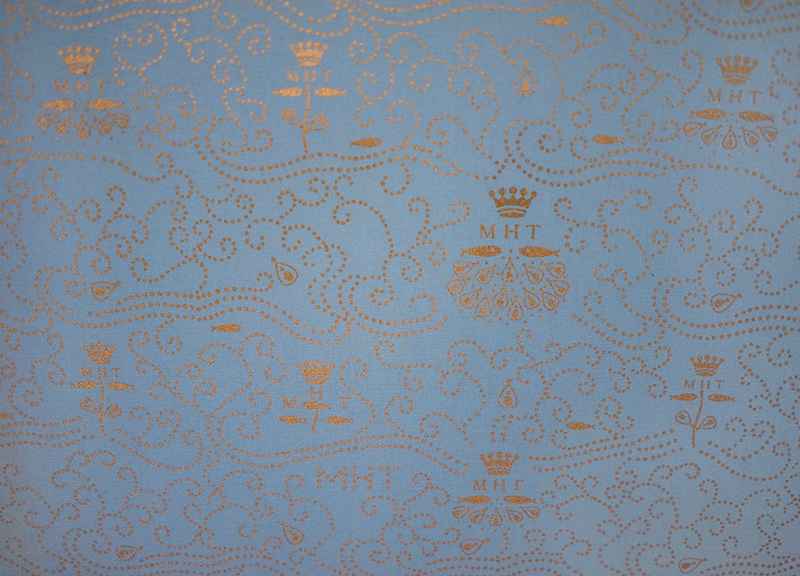 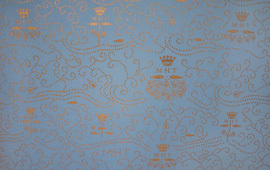 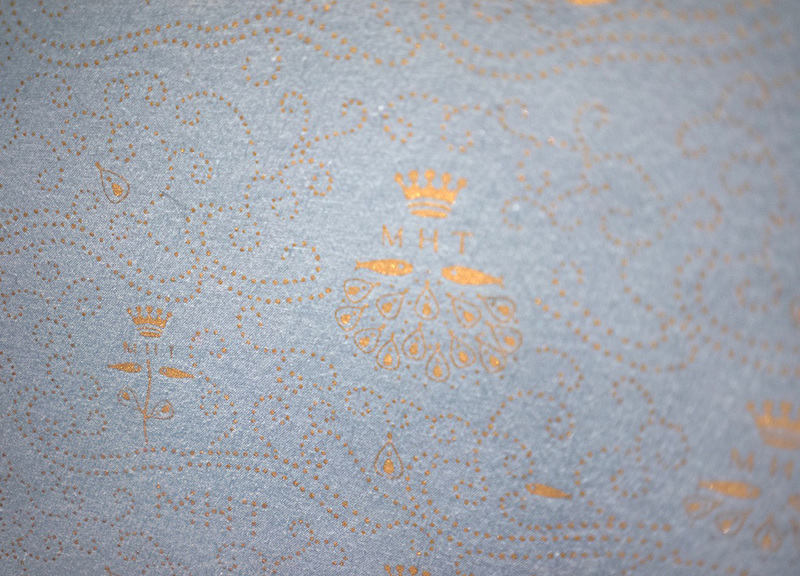 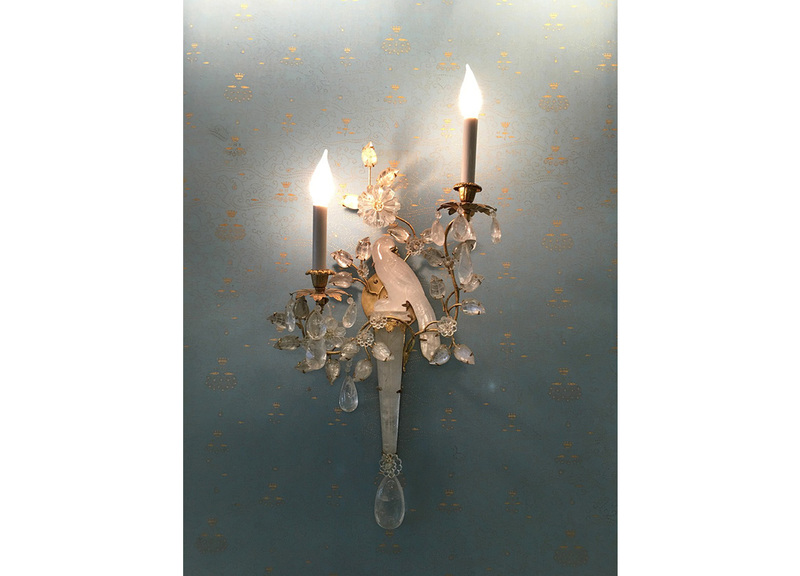 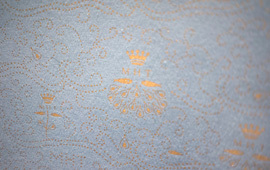 Inspired by Marie Antoinette’s theatre at Versailles, de Taillac commissioned powder blue wallpaper accented with her logo in gold ink. 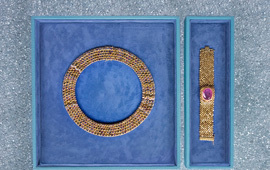 Yet the French queen’s style did not influence everything. 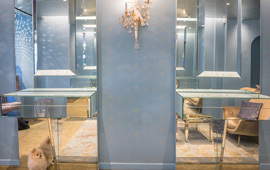 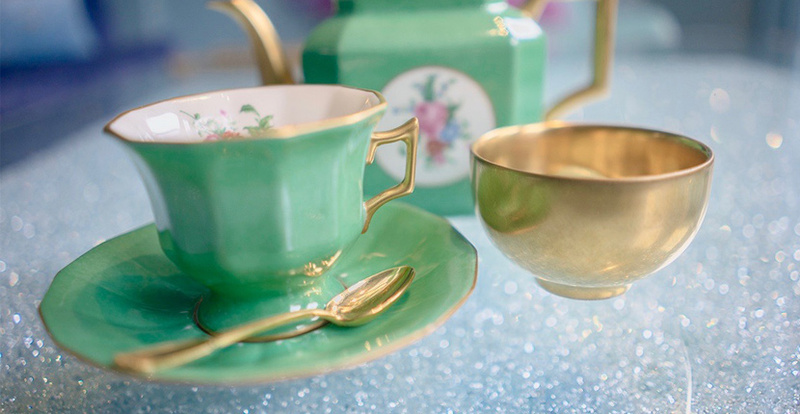 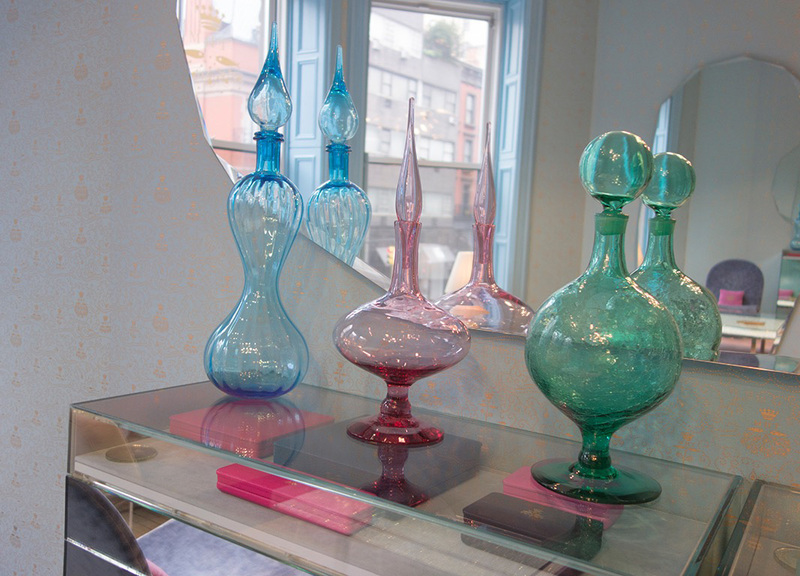 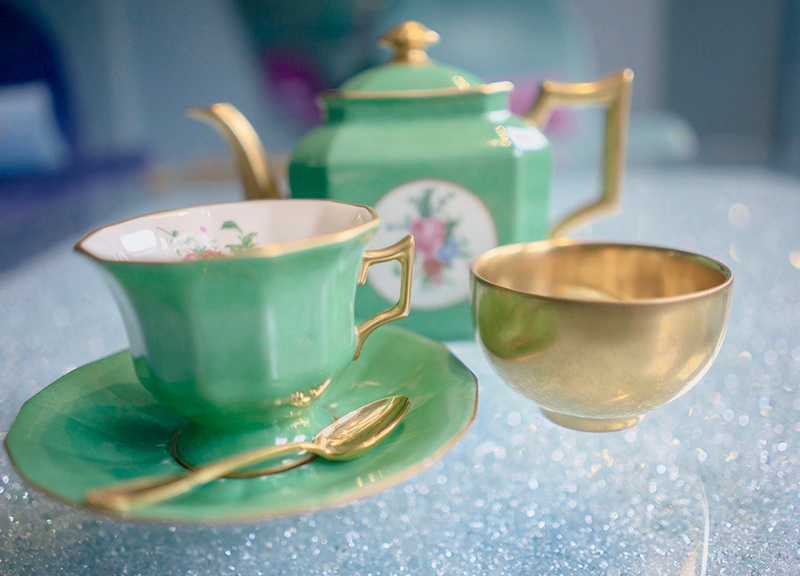 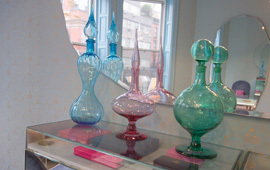 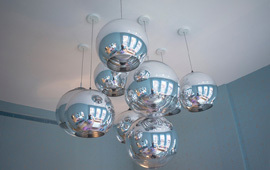 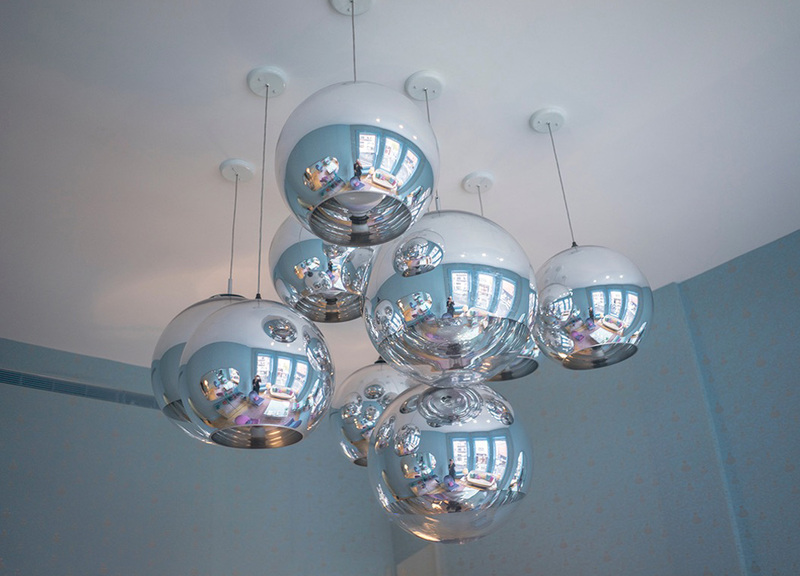 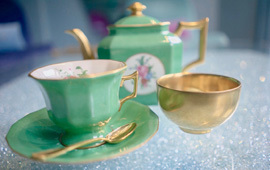 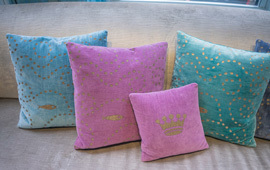 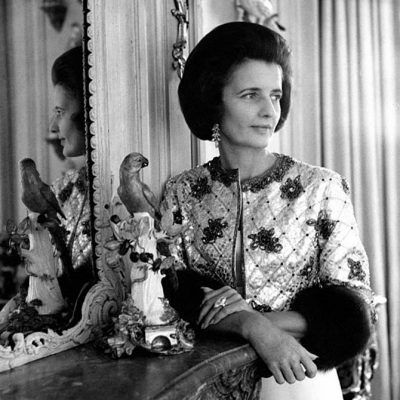 De Taillac followed her imaginative heart to create the enchanting interior design. 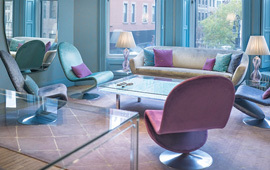 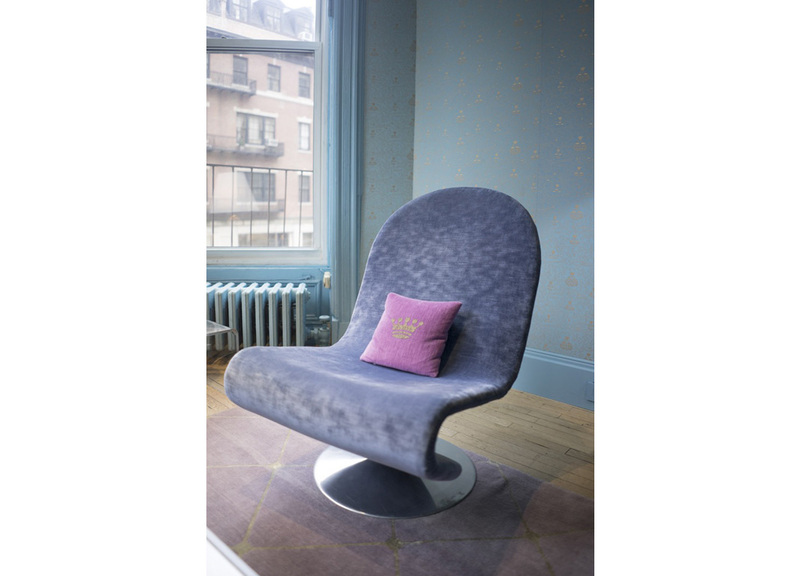 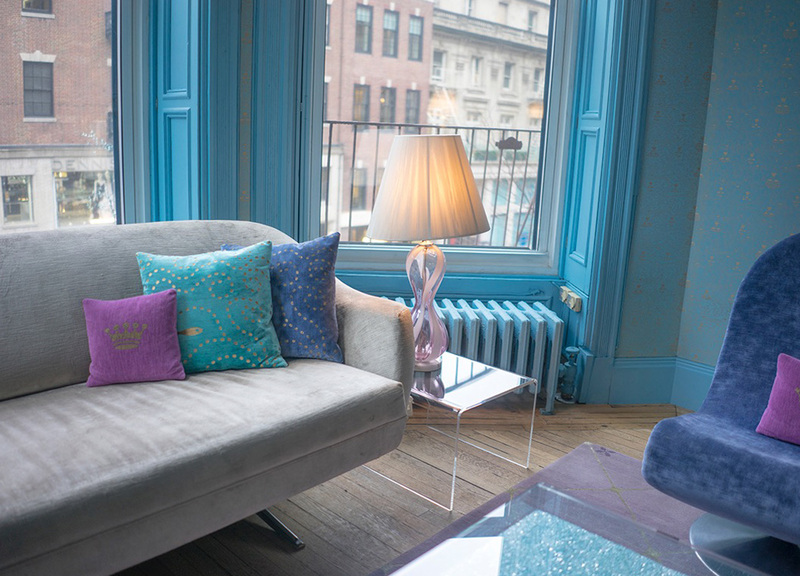 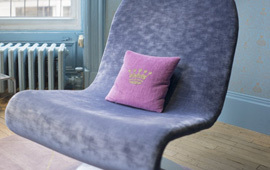 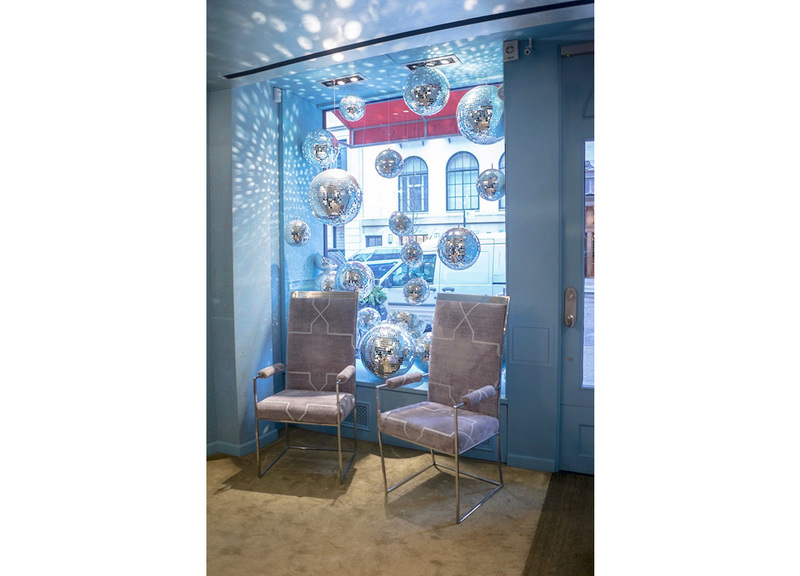 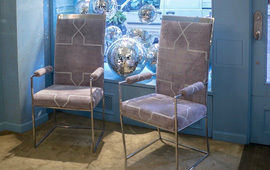 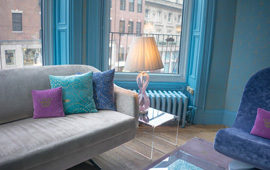 In the private salon space there is 1960s organically shaped furniture by designer Verner Panton with custom velvet upholstery in the sweet colors of Ladurée macaroons. 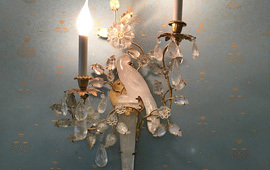 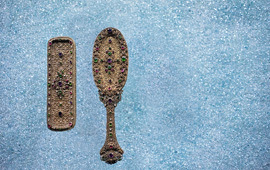 Glistening vintage mirrors and sparkling Baguès-style sconces with crystal parrots flew to New York from the famed flea markets in Paris. 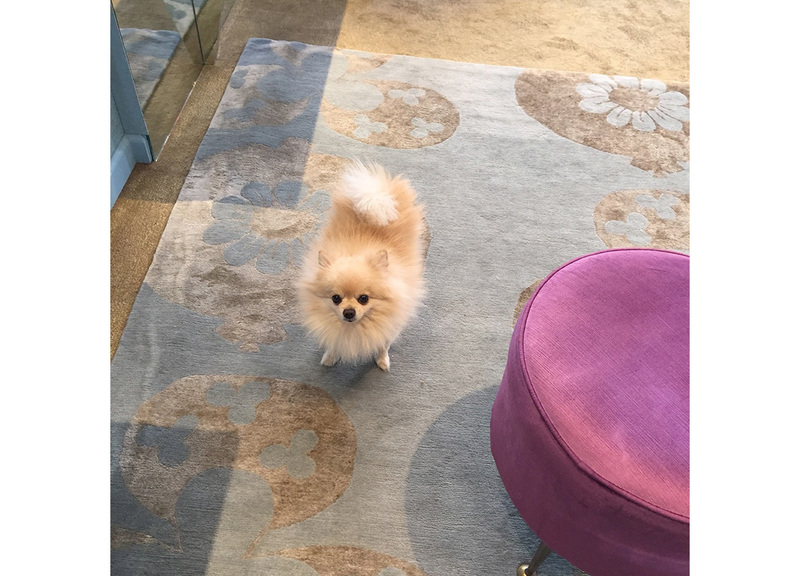 Luxurious Madeline Weinrib rugs cover the floors. 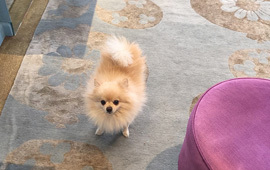 Yet the unofficial mascot to the establishment, a Pomeranian named Chivas, does make one’s mind wonder back to the the eighteenth century French court. 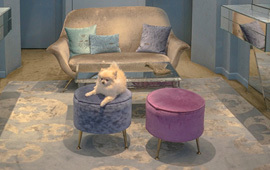 The adorable creature would fit right in with the dogs featured in Sofia Coppola’s 2006 film Marie Antoinette. 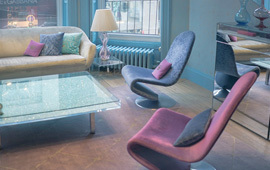 Personal touch: De Taillac’s bold redesign of a 1961 plexiglass Yves Klein table shows off her passion for gems. 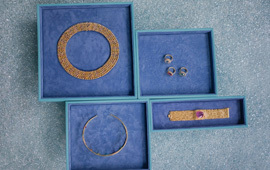 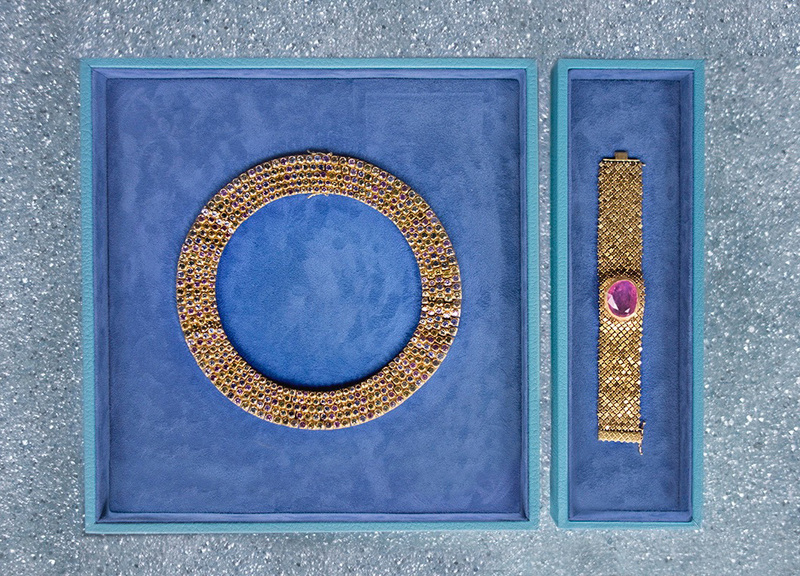 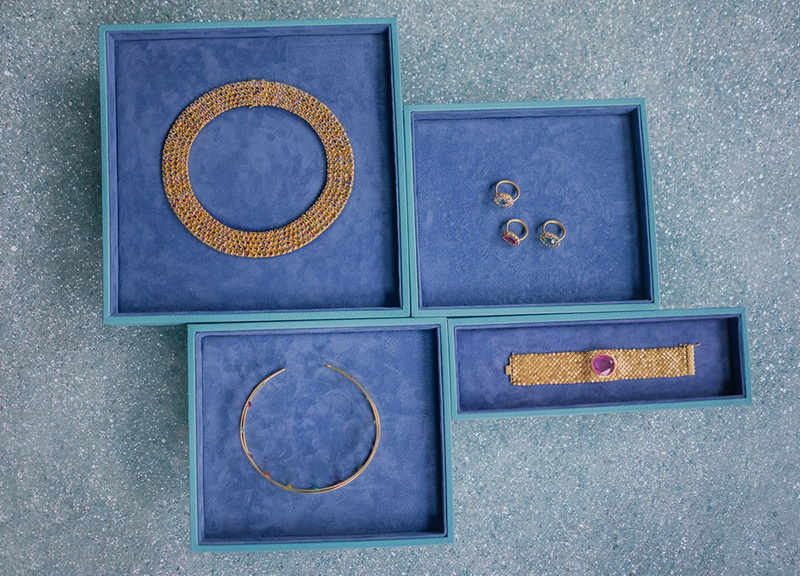 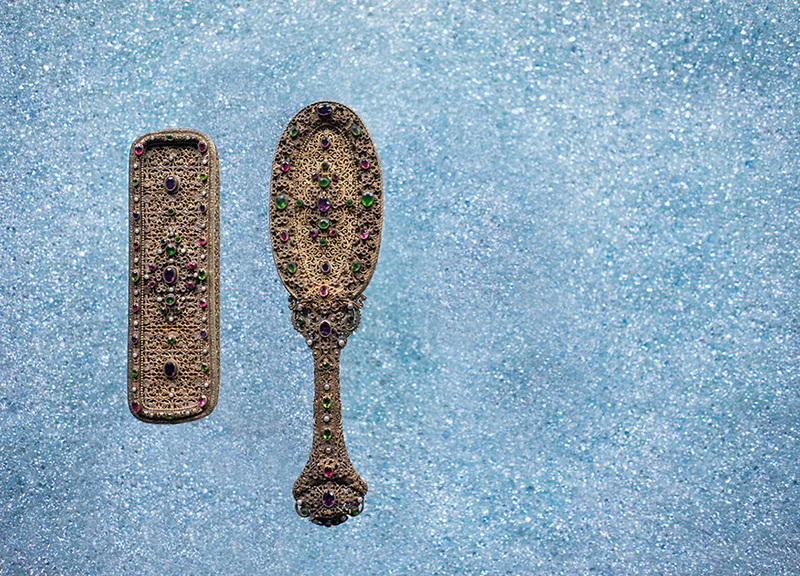 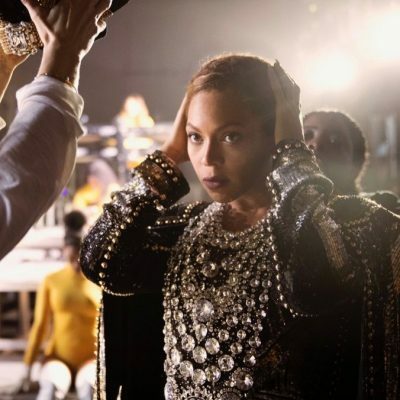 The designer removed the original pigment inside the clear box and replaced it with 46,000-carats of aquamarines.